Among a sea of bands in Portland’s fertile indie rock scene, Ape Cave — formerly known as Church — emerges with an avant-garde minimalist sound that reflects the group’s complex and particular arrangements. The band was formed by Richard and Brandon Laws, two brothers with a passion for music. They spoke with SF Station during a phone interview while on tour in support of the Band’s debut LP Songs Force Crystal. 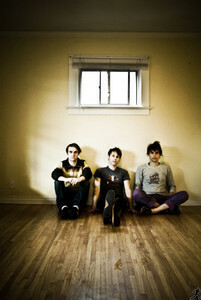 Ape Caves performs at Hemlock Tavern on December 29th. SF Station (SFS): Your old band name Church was really hard to search for on the Internet, so you changed it? Brandon Laws (BL): Well, it wasn’t just because of that. It was also because the band The Church contacted us recently and politely threatened legal action. SFS: Did you get any complaints from religious people about being named Church? BL: The reason we picked that band name wasn’t for a religious reason. It was spiritual inclinations because music means a lot to us. Richard came up with the name, and was thinking that music is our version of church, our religion. SFS: How did you choose the name Ape Cave? BL: When we began Church, there were only three band members. Then we went on a tour with this band called the Ocean Floor, which is up in Washington, and that’s where we met Lane who is our fourth band member. The next day we went to hang out at these caves near Mt. Saint Helen called the Ape Caves, so we picked that name because that’s kind of the beginning of our band. SFS: Does it feel cluttered in the Portland scene? I read there is something like 2,500 bands in Portland. BL: If it’s cluttered, we’re not really feeling that yet. There are a steady number of venues. It’s not like people are really as competitive as LA or Las Vegas. Also, with Ape Cave most people who come out to our shows are musicians, especially in Portland. It’s actually helpful to have 2,500 bands because those are the people who appreciate our music first. SFS: You’re music has been described as avant-garde, which might intimidate the average listener. Do you ever worry that your music might be too complex for some people? BL: That may worry our label person, but it doesn’t worry us at all. We do play complex music, but it’s also really poppy. SFS: I imagine that as your band continues to grow that with your constraining, and minimal style, there might be a juggle of ideas in terms of which instrument you use. BL: I do see that minimalist idea is still holding true that when were thinking of chord progressions. We don’t like having unnecessary notes, or unnecessary parts. It’s like each person is cutting it down to the building blocks, but definitely things are getting more flushed out. SFS: Would you say this exemplifies your daily life? Are you a minimalist? BL: I am. I probably can fit both my belongings and musical gear into my Toyota Tercel. I think definitely people make art that echoes their lives. SFS: Sometimes it could be a reaction. SFS: In the introduction of “Crab Magic” what is the sample or noise in the beginning? It sounds like voices played backwards? BL: That sample is “Crab Magic,” demo version, in reverse with some effected sounds and pan flute samples. SFS: On “Opposite People,” the song begins with “Come with me outside to the sun.” Then on “Crab Magic,” the lyrics begin with “I won’t leave you outside.” Is this an intended motif? Is this album directed at someone in particular? BL: I don’t know I would have to ask Richard that. He’s right here would you like to ask him that? Richard Laws (RL): It was not really an intended thing. I know it did end up like that. It’s kind of funny, the way I write songs sometime it can end up being a broad range of things instead of a specific event. So I feel like certain things from one song kind of end up in other songs if they were written around the same period of time. It’s usually not intentional, but not avoided. SFS: You say it’s usual a broad range of things, but is there someone particular you’re asking to come outside? RL: Yeah, it was a particular person. Probably it would be the same person, or at least in part the same person from both those songs. SFS: You don’t have to say the name, but may I inquire the relationship with this person? RL: It was someone I was just spending a lot of time with at the time. We were really close. We were also very different people. I felt like often times I was pleading with her to do things that I thought would be good for her that she wasn’t willing to do. SFS: Where do you hope to see yourself two years from now? RL: I would like to be doing what I’m doing now, but doing it better. 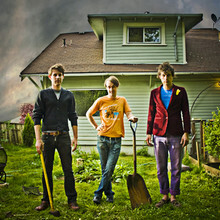 Ape Cave performs at Hemlock Tavern on December 29th. Tickets are $6. The show begins at 9pm.